Incorporating wildlife data into spatial analysis can be a challenging task. 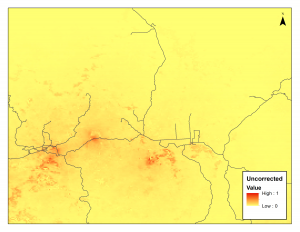 Spatial analysis is a type of geographical analysis that involves measuring the spatial relationships between the locations of events, and modelling their relationships to underlying factors that explain their distribution. Geographers often recall Waldo Tobler’s first Law of Geography: “everything is related to everything else, but near things are more related than distant things” – a principle that characterizes how many natural phenomena are distributed in space. 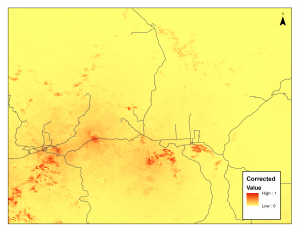 A Master’s of Science student in Geography at Wilfrid Laurier University, Lauren Yee investigated how records in the CWHC’s surveillance database could be used in a spatial analysis context. Specifically Lauren set out to examine spatial factors related to white-nose syndrome in bats observed in Ontario, Canada. One of the most widely used set of spatial analysis tools for understanding the distribution and characteristics of wildlife habitat is species distribution modelling. Species distribution models (SDMs) attempt to predict where a species will occur in an environment based on past observation locations and the environmental or climatic conditions associated with them. The benefit of using a SDM is that once relationships are fit, the model can predict habitat suitability, even in areas that have not been sampled. Historically, wildlife data resided in historic museum collections and often did not contain detailed geographic information. Location tracking has been greatly eased with the advent of GPS, smartphones, and online web-mapping tools, so the swath of wildlife observational data with explicit and detailed geographic information has been increasing greatly. While increasing sources of explicit geographic data offers the potential for a better understanding of wildlife and their habitats; uncertainty remains about how representative these observations are of a species’ requirements. A component of this research looked at how the accessibility of locations might determine where wildlife are sampled or recorded. Accessibility here refers to the uneven patterns in data that can arise from the level of ease at which observations are made. For example, observations of wildlife may be counted more frequently in areas where there are more humans or alongside major roads. The CWHC’s Wildlife disease database was a valuable resource for obtaining bat mortality data across Ontario. Lauren’s MSc research used mortality data as a proxy for bat sightings and observations to use in a SDM. Although wildlife mortality data is collected for a different purpose than some conservation or citizen science databases, it also is associated with an accessibility bias, as wildlife disease data typically arise from opportunistic sampling rather than random sampling. One challenge faced through this research was finding applicable datasets in Canada for bats. 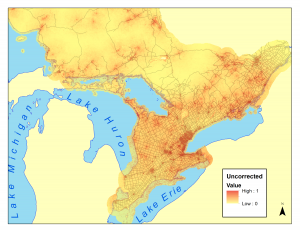 Across Canada, hibernacula locations are not recorded in a centralized database. Since many of the bats faced with WNS hibernate in caves or abandoned mines, these data are essential for accurate mapping of habitat suitability. Most of the datasets for this research were obtained through Land Information Ontario’s comprehensive spatial database. The accessibility bias in data can be accounted for through various data manipulation techniques and parameter settings in the species distribution models to account for bias. In this research, numerous methods were employed to examine and mitigate spatial biases. A model was created based on Ecological covariates for bats that found distance to hibernacula contributed to 83.7% of the model variance, followed by maximum normalized vegetation index (8.3%), the minimum temperature of the coldest month (4.3%), precipitation seasonality (2.7%) and distance to abandoned mines (1.1%). To examine how much accessibility bias influenced the models, a second model based on accessibility was created. 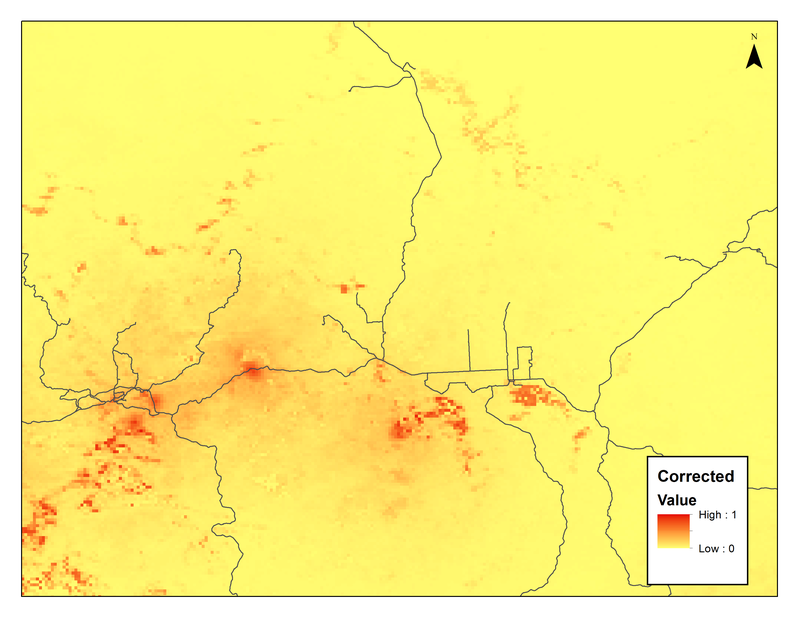 The accessibility model could predict bat locations based on the distance to major roads, which accounted for 93% of the model variance. This indicates accessibility covariates were able to predict the distribution of bats better than the ecological covariates. This means that proximity to major roads is a major bias for bat species data, which is further confounded by the bat’s use of abandoned mines, which are typically in close proximity to a road. Figure 1: Habitat Suitability of bats in South Western Ontario overlaid with Ontario’s road network. This map is uncorrected for accessibility bias. Through this research, with the above taken into consideration, habitat suitability for bats and suitability for WNS were mapped. These maps can be further evaluated and used for conservation planning and realizing potential areas that may contain suitable conditions for WNS development so it can be mitigated. Correcting for accessibility bias in habitat suitability models is another challenge to overcome. Lauren created models to account for this accessibility bias that lowered habitat suitability in areas where there were many roads and no observed bat species. 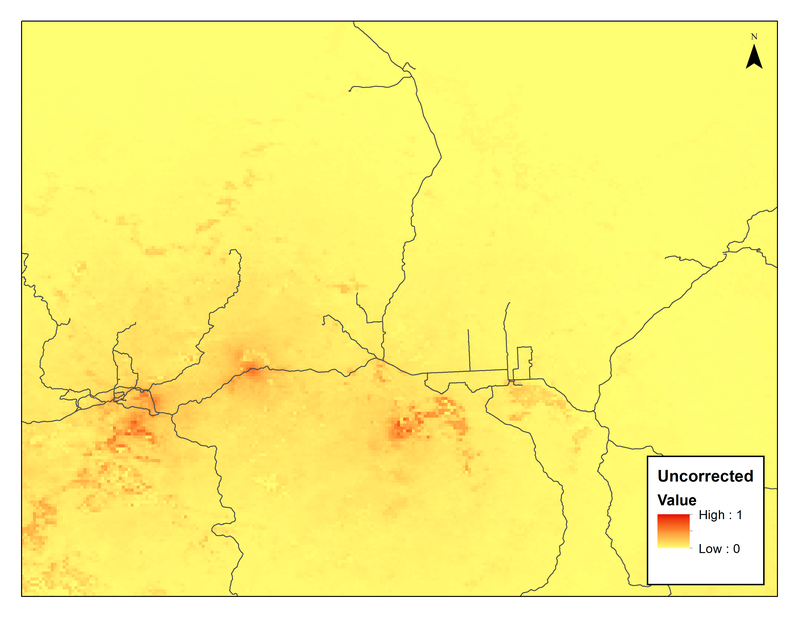 Figure 3 Correcting for accessibility revealed higher habitat suitability in the top portion of this map that was previously not suitable habitat in the uncorrected model. Figure 4 Habitat suitability corrected for accessibility. Notice how habitat suitability is lower in South Central Ontario and is more generalizable than the uncorrected model. There are many challenges that threaten the future of bat species in Canada, such as white nose syndrome, wind turbines, predation from cats, habitat fragmentation and climate change. Spatial tools can and should be used as part of the solution to protect bat species.